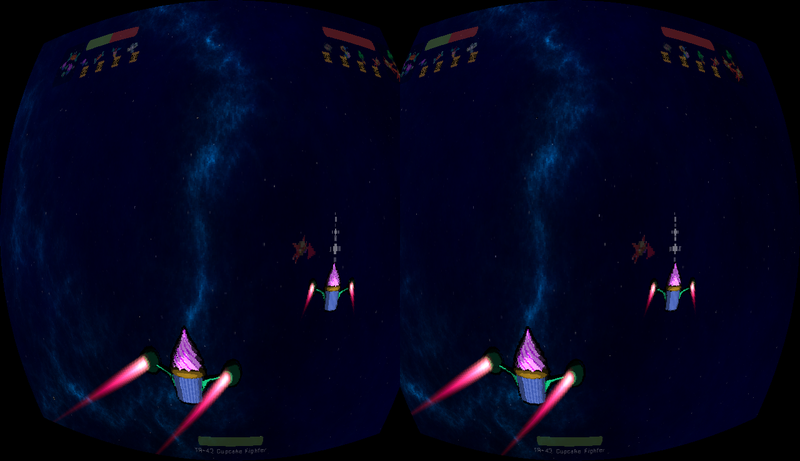 Galactose: Pastries in Space: Oculus Rift Support! 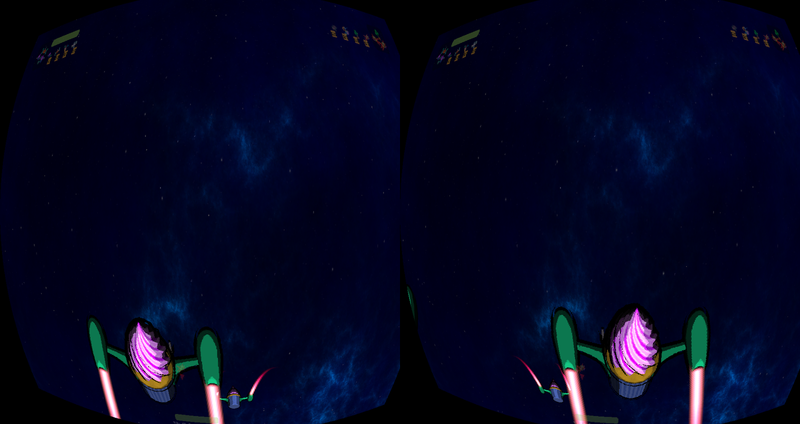 I'm currently working on adding Oculus Rift support to Galactose. This is something that I've been slowly working on for a while now, and its finally starting to come together a bit. 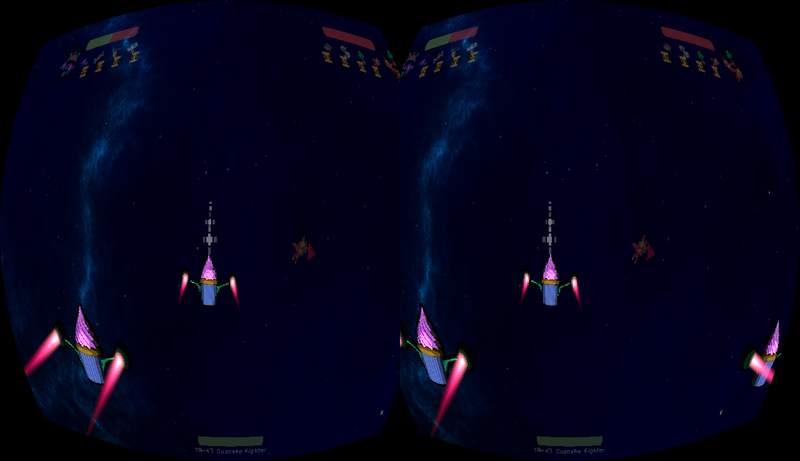 While its not quite ready for primetime, its come far enought that I'm pretty confident that we'll be able to show off basic Oculus Rift support at MAGFest. One thing that should be noted in these images for anyone who tries to look at them in an Oculus Rift, is that I'm still dealing with a few bugs related to the distortion effect, so things around the periphery will look quite a bit distorted still. (That and the UI is probably not close enough to the center of the view). Looking around from the point behind the camera isn't really that handy. 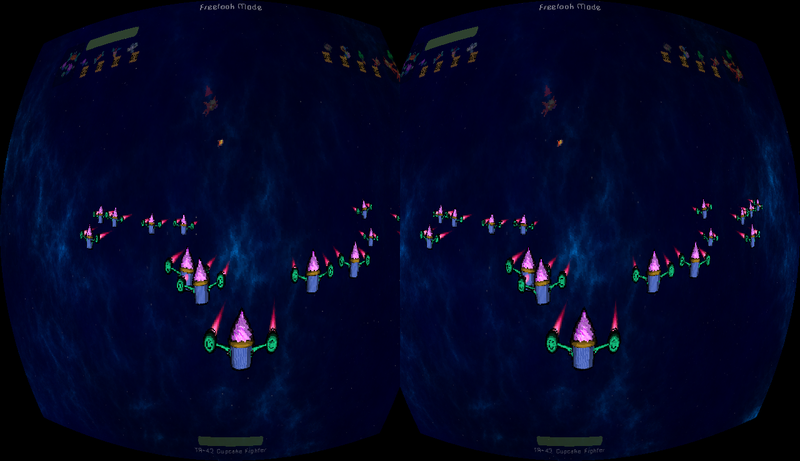 One of the things I found while testing headtracking is that simply looking around the battlefield is kinda useless, so what I'm thinking is that when you look around with your head, the view should orbit your current ship(in drone view), so that if you look behind yourself, you'll be looking at your ship from the front and seeing anyone pursuing you. I'm also thinking it would be a neat way to aim in a direction other than the one your flying in, which could be pretty cool, although I'm a bit less set on that. This is kinda what I'm thinking looking behind you should see. This is what happens when you don't adjust the projection matrix when rendering. If you try and view this through the rift, you'll see the tho ships look close together, but look as if the engines are conjoined. Further, things in the distance won't converge to the same point, but will instead converge to almost parallel points. To anyone out there trying to implement rift support and who gets two parallel images which don't seem to convert, you need to adjust your projection matrix a bit for each eye, adding(or subtracting) part of the z-component to the x-component. This took me a while to realize for some reason, and was compounded because I wasn't even really sure what to call that problem. Anyways, we'll probably push out a public new release with some incremental changes and rift support sometime after we demo the new features at MAGFest, so look forward to that in the not-to-distant future.